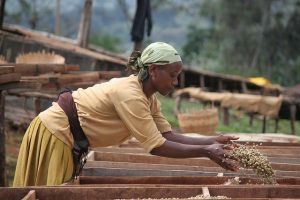 Ethiopia is the birthplace of coffee, and the aromatic Yirgacheffe coffee is one of the most prized local varieties. 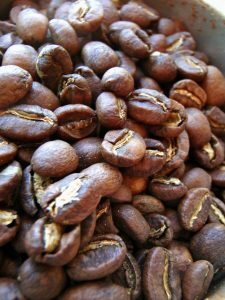 In Korea, where it has earned the nickname ‘Noblewoman of Coffee’, this coffee bean most often goes under the name 예가체프 Yegachepeu, while more recently some people have also started calling it 이르가체페 Ireugachepe. But the form closest to the original pronunciation would in fact be 이르가처페 Iregacheope. Yirgacheffe is a town in south central Ethiopia that lends its name to the surrounding area and the coffee produced there. 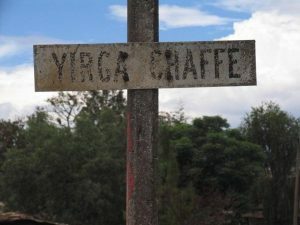 While the coffee variety is usually spelled Yirgacheffe in English, the town itself appears in online maps variously as Yirga Chefe, Yirga Cheffe, Yirgachefe, and Yirga Ch’efē. The English Wikipedia article on the town currently uses the spelling Irgachefe. And at least one of the local signs uses the spelling Yirga Chaffe, as seen in the photo below. While it is less the case now, it recalls how Korean place names could be known under a bewildering variety of romanizations. This name comes from Amharic, the official language of Ethiopia. In the Ethiopic script, it is written ይርጋ ጨፌ (repeated in larger size below this paragraph). Amharic belongs to the Semitic branch of the Afroasiatic language family. According to the 2007 census, it is used as a primary language by 29.3% of Ethiopians, behind Oromo which is used by 33.8%. But the Amhara people have been the dominant group in Ethiopia, and most Ethiopian emperors were of Amhara origin, so Amharic is to this day the sole official language. And while Oromo is traditionally considered a single language in Ethiopia, from a purely linguistic point of view it should be seen as a collection of several related languages. Semitic languages such as Amharic, Tigrinya (the official language of Eritrea), and Tigre in Ethiopia and neighbouring Eritrea use the Ethiopic or Ge’ez script, originally used by Ge’ez, the Classical Ethiopic language. The Great Dictionary of Standard Korean (표준국어대사전) calls the Ge’ez language 게즈어 Gejeu-eo in Korean as if the pronunciation was [ɡeːz], but since the original name is ግዕዝ Gəʿəz [ɡɨʕɨz] it is also called 그으즈어 Geueujeu-eo to be more faithful to this form. The Semitic Ge’ez language was the official language of the ancient kingdom of Aksum and today serves as the liturgical language of the Ethiopian Orthodox Church, the Eritrean Orthodox Church, and the Ethiopian Catholic Church. While it is usually supposed that Ge’ez gave rise to the modern Semitic languages of the region, the exact family tree has not been agreed upon. There is no single agreed-upon romanization of Amharic. Here, we shall use the system used by the Encyclopaedia Aethiopica, the so-called EAE romanization. According to this system, ይርጋ ጨፌ is romanized as Yərga Č̣äfe. There is also the system used by the United States Board on Geographic Names (BGN) and the Permanent Committee on Geographical Names for British Official Use (PCGN), the BGN/PCGN 1967 romanization, which gives Yirga Ch’efē for the same name. The Loanword Transcription Rules (외래어 표기법) do not cover Amharic or Ge’ez, and the hangul (Korean alphabet) transcription of Ethiopian names used to be simply based on whichever romanization was commonly used for a particular name without consideration for the original form and pronunciation. However, more recently approved transcriptions have started taking the original pronunciations into account. Perhaps the biggest choice faced by anyone trying to transcribe any of the Ethiopian Semitic languages in hangul might be how to write ə [ɨ] and ä [ə]. One should be careful not to confuse the two vowels, despite the fact that the former is written ə in the EAE romanization and the latter is pronounced [ə]. The high central unrounded vowel [ɨ] is quite close in pronunciation to the Korean vowel ㅡ eu (that is the hangul letter for this vowel, not a dash). In fact, in older writings you can often see ㅡ eu transcribed as [ɨ], though nowadays it is usually transcribed as the high back unrounded vowel [ɯ]. In addition, the Ge’ez script writes consonants not followed by a vowel with the same letter that is used for the same consonant followed by ə [ɨ], which is convenient as ㅡ eu is the default epenthetic vowel used in Korean when adapting sounds from other languages. Therefore, ㅡ eu is the best candidate for transcribing Amharic ə [ɨ]. In 20 June 2013, the 109th Council of the Joint Committee of the Government and Press on Loanword Review (정부·언론 외래어 심의 공동위원회) put this into practice by approving 게타처우 응그다 Getacheou Eunggeuda as the hangul transcription of the personal name ጌታቸው እንግዳ Getaččäw Ǝngəda [ɡetatʧəw ɨnɡɨda], which is usually romanized Getachew Engida. The same example shows that ä [ə] is mapped to ㅓ eo. In conservative standard pronunciation of Korean, the short version of this vowel is [ʌ] and the long version [əː], so ㅓ eo is used for both /ʌ/ and /ə/ in transcribing English. The same mapping of ä [ə] to ㅓ eo is also seen in the decision on 12 July 2013 by the Working Committee for Reviewing Loanword Transcription to write ገብረኢየሱስ Gäbräʾiyäsus [ɡəbrəʔijəsus], usually romanized as Ghebreyesus, as 거브러여수스 Geobeureoyeosuseu. But how should we transcribe yə [jɨ] in ይርጋ ጨፌ Yərga Č̣äfe in hangul? There is no letter in current use in Korean for [jɯ], the combination of a yod and ㅡ eu. Here, the natural choice would be ㅣ i. After all, [ɨ] is a sound intermediate between ㅣ i and ㅡ eu, and ㅣ i is also the vocal counterpart to the palatal approximant [j]. We can also note that ‘Irgachefe’ is one of the romanizations used for this name. In 29 April 2015, the 120th Council of Loanword Review approved writing ሽፈራው ሽጉጤ Šəfärraw Šəguṭe [ʃɨfərraw ʃɨɡutʼe], usually romanized Shiferaw Shigute, in hangul as 시퍼라우 시구테 Sipeorau Sigute. In other words, šə [ʃɨ] was mapped to 시 si. The fricative sound [ʃ] written ‘sh’ in English corresponds to 시- sy in hangul (combining with the following vowel as in 샤 sya and 쇼 syo), so seeing how it combines with a following vowel is a good guide for how to write combinations of the same vowel with the palatal approximant [j]. Therefore, to be consistent with the recent transcriptions of Amharic, ይርጋ ጨፌ Yərga Č̣äfe should be written 이르가처페 Ireugacheope. A place name which is written as several words in the original is generally written as one word without spaces in hangul transcription.  As the most popular romanized form Yirgacheffe is also written as a single word without spaces, it is unlikely anyway that anyone would write the name in Korean as two words. Amharic ይርጋ Yərga appears frequently in names of people and places. As a personal name, the meaning of ይርጋ Yərga is given as ‘may he/it be calm’. In the list of standard loanwords transcriptions, we can also find the place name ‘Yirga Alem’ 이르가알렘 Ireugaallem from southern Ethiopia. The Amharic name is ይርጋ ዓለም Yərga ʿAläm [jɨrɡa ʔaləm], so a closer transcription to this would be 이르가알럼 Ireugaalleom. There is also the shortened form ይርጋለም Yərgaläm [jɨr.ɡa.ləm], which would be 이르갈럼 Ireugalleom. The name is said to mean a ‘may the world be calm’. As ጨፌ Č̣äfe is glossed as ‘marsh’, perhaps ይርጋ ጨፌ Yərga Č̣äfe means ‘may the marsh be calm’. Thus far, we have seen that the town in Ethiopia and coffee variety that is known as Yirgacheffe in English should be written as 이르가처페 Ireugacheope in Korean if we follow the Amharic pronunciation. Does this mean that we should stop saying 예가체프 Yegachepeu and say 이르가처페 Ireugacheope from now on? It is true that the form 예가체프 Yegachepeu lacks a sound basis, as it came from the mistaken assumption that the final ‘e’ of Yirgacheffe (or whatever romanized form it was based on) was silent (the ㅡ eu at the end represents an epenthetic vowel). In addition, the first syllable 예- Ye- can’t correspond to any possible pronunciation of Yir-, Yer-, Yar-, Yr-, or Ir- in English. It is as if someone took a form like Yergachefe or Yergacheffe and just skipped over the ‘r’ sound as if it was Yegachefe with a silent ‘e’ at the end. When loanwords become an established part of the language, however, it is rather pointless to try to ‘correct’ them even if they do not obey today’s loanword transcription rules. In fact, they often turn out to have less obvious word histories that explain their current forms. As an example, the Korean word for ‘cashmere’ is 캐시미어 kaesimieo. As the pronunciation of the word in English is [ˈkæʃ.mɪə̯ɹ, kæʃ.ˈmɪə̯ɹ, (ˈ)kæʒ-], it should written in Korean as 캐슈미어 kaesyumieo according to the loanword transcription rules because [ʃ] should be transcribed as 슈 syu before a consonant. However, 캐시미어 kaesimieo actually seems to derive from an old-fashioned variant of the word, ‘cassimere’. This is no longer commonly used in English, and when it is, ‘cashmere’, ‘cassimere’, and another variant ‘kerseymere’ all mean slightly different things. All these terms incidentally derived from the place name now commonly spelled Kashmir, which is 카슈미르 Kasyumireu in Korean. However, it would be difficult to argue that 예가체프 Yegachepeu has the vintage of 캐시미어 kaesimieo in Korean or that it has become established in the language to the exclusion of competing variants, given the recent emergence of the form 이르가체페 Ireugachepe not to mention the fact that only a tiny minority of coffee enthusiasts are likely to have heard of any form of the name in Korean. Unlike 카레 kare (from Japanese カレー karē) and 커리 keori (from English ‘curry’), which refer to different kinds of food, these are simply competing forms for the same name. Between the two, 이르가체페 Ireugachepe is definitely closer to the Amharic original. We could even choose to use one name for the coffee and another form of the same name for the place name. But in the absence of an entrenched Korean name, wouldn’t it be better to use the same form for the coffee and the place in Ethiopia, a form closest to Amharic pronunciation? That is why I hope 이르가처페 Ireugacheope catches on. Oh, and how should English speakers pronounce Yirgacheffe? If the goal is to imitate the Amharic pronunciation using the sounds available in English, then yeer-gə-CHUFF-eh [ˌjɪə̯ɹ.ɡə.ˈʧʌf.eɪ̯] might be your best bet. Whether that would be understood by your non-Ethiopian barrista is another question. Previous Post How do you write Ngũgĩ wa Thiong’o’s name in Korean?